Have you ever considered using rubber bands in home decor? I probably wouldn’t have initially but when you have a lot of them, you begin to think creatively. These rubber band crafts not only make use of all your extras but they look great in your home. There are some ways that I like to use rubber bands that are helpful in the process of completing decorating projects. One handy tip is to wrap a rubber band around a can of stain or paint lengthwise and at the middle. This way, when you dip your brush into the can, you can wipe it against the rubber band. This helps to eliminate the excess on the brush and prevent dripping. I have also used rubber bands to temporarily secure items together in a variety of different craft projects. To keep ribbon spools from unwinding, simply wrap a rubber band around the spool. Rubber bands can double as an eraser. As I began to look around, I found several fun rubber band crafts that are perfect for incorporating into home decor. Here are just a few of my favorites. 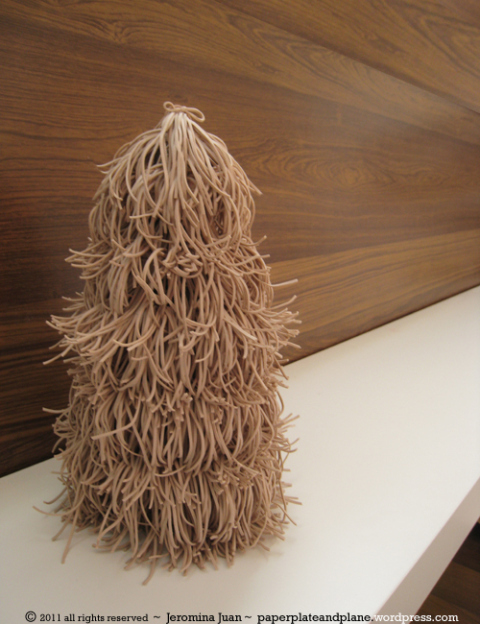 This cool shaggy rubber band tree makes a unique and neutral Christmas tree. It can be used really any time for some whimsical tree decor. If you wanted to add color, just use colored rubber bands. I also like this sleek style of tree. 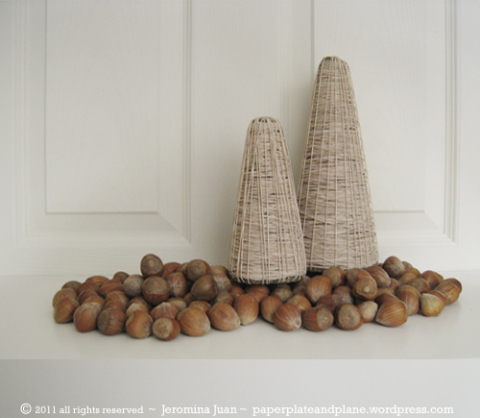 The cone rubber band trees look great in a rustic Fall setting. 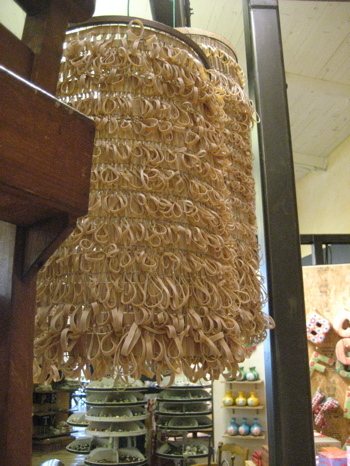 Recreate this fun Anthropologie lampshade by attaching your own rubber bands to a lampshade. 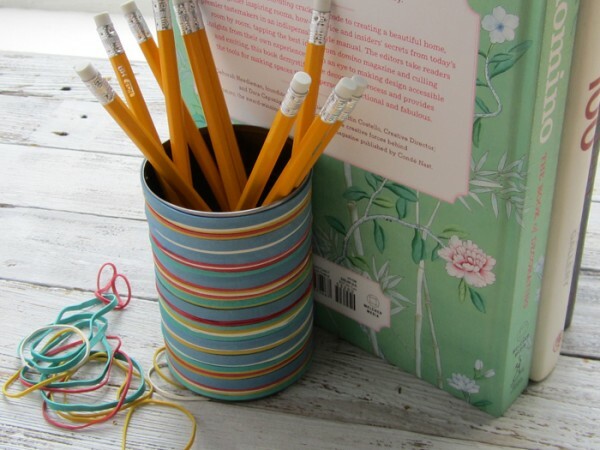 Recycle a can and a bunch or colorful rubber bands at the same time to create this hip pencil holder. Just slip the rubber bands over the can without twisting. Something you may not have considered is using rubber bands in a furniture makeover! I know I hadn’t. 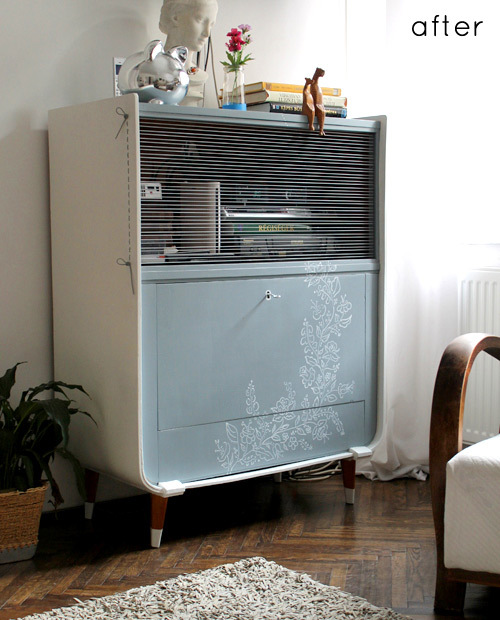 This cabinet makeover turned out great with a rubber band screen at the top. 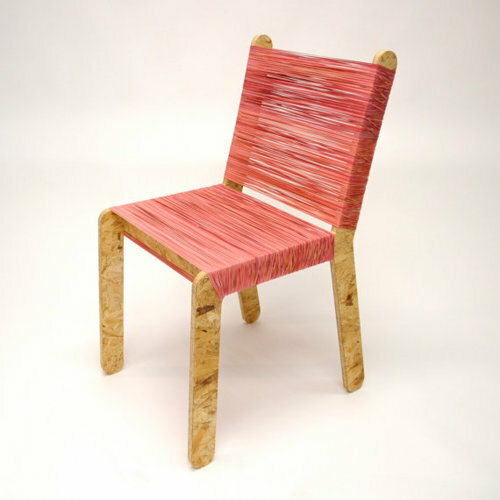 This cool chair was made from particle board and wrapped with large rubber bands. It may also be a fun thing to consider if you have an old chair frame in need of a new seat or back. 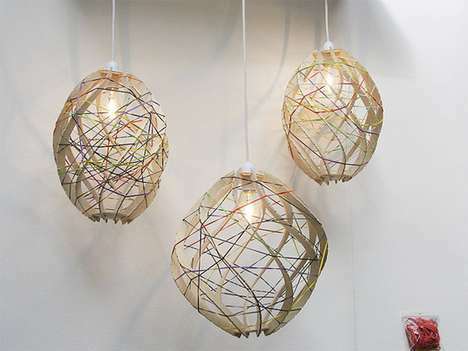 Dress up some glass or metal framed pendant lights with a colorful pattern of rubber bands. Creative lighting makes a great focal point in your decor.